* Nepamirskite šiam produktui nupirkti valdymo prietaisa! Effective reduction of heat entering the room. Provides added protection for the window e.g. against falling tree branches etc. Effective reduction of heat gain achieved by coatingon the inside surface of slats. Good sound reduction and heat insulation. Protection from excessive cooling of glazing during winter. 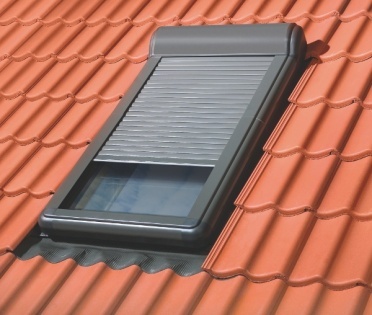 Solar cell powered shutters available (ARZ solar). ARZ, ARZ solar and ARK roller shutters are made from polyester coated aluminium, and come in two colours – light grey (RAL 7035) and dark grey (RAL 7022). ARZ-H shutters are operated manually from the inside; the ARZ-E and ARK-E use a crank or electric operating system. Roller shutters are easily installed without the need to work on them from the outside. Because it is powered by a solar cell installed in the casing of the shutter ARZ solar roller shutters can be installed in places where there is no mains supply. ARZ and ARZ solar shutters can be mounted on standard and non-standard centre pivot FT windows and on vertical combination windows (assuming that the minimum space between the windows in the system is 20 cm). The ARK shutter is designed for top-hung FK windows and FE emergency escape windows.